Miss Mary Ann Read taught at Wollongong Public School for 40 years. She was gazetted as an assistant teacher at Wollongong on 7 August 1886 and retired on 12 August 1926. Mary was the daughter of James Read and Sarah Lee who were married 1859. Over the next twenty years, they had eleven children of whom Mary Ann (born 17 August 1861) was the second eldest. The family lived in the Largs-Morpeth area of the Hunter Valley. Mary Ann commenced her teaching career aged 14 on 6 December 1876 as a pupil-teacher at Dunmore Public School ( now Largs) near Maitland. In January 1881, she went to Sydney where she undertook a six month course at the Fort Street Training School. On graduating, she was posted from 3 August 1881 to 4 July 1883 at Dungog Public School. Her next appointment was to Tighes’ Hill Public School near Newcastle where she passed her promotional examination. In September 1885, she was instructed to go to Esk Bank Public School near Lithgow. On 7 August 1886, Mary was appointed as an assistant teacher at Wollongong Primary School. She was promoted to the temporary position of Infants Mistress in August 1887 having failed the examination necessary for her promotion. Her position, however, was confirmed in 1888 and she continued in that position until she retired in August 1926. Mary was promoted in 1920 to 1B classification which was the second highest level for primary and infant teachers. At that time, it was the highest classification awarded to women and precluded them from being in charge of schools with more than one teacher. They also earned less than their male colleagues of the same classification. Most teachers were male as women had to resign from the Public Service when they married. All was not clear sailing for Mary, in 1904, she was formally cautioned for neglecting to record all instances of corporal punishment. (New South Wales. Teachers' Rolls, 1869–1908. NRS 4073). Miss Read was a tall, stately woman who wore glasses and kept her hair in a bun. 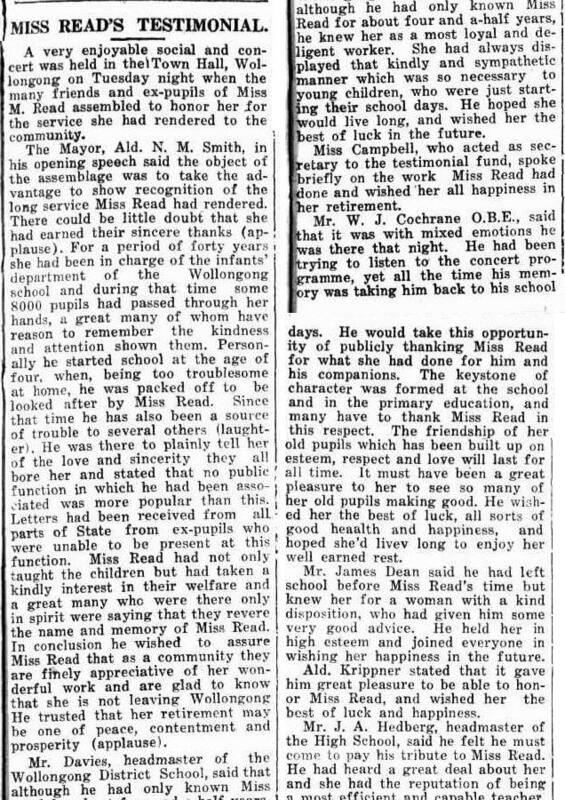 She was well known in Wollongong and lived at Mrs Hosking’s boarding house for teachers in Smith St. The boarding house was located on the northern side of the street opposite Little Milton (31-33 Smith Street). She attended the 11.00am services at St Michael’s Church of England. Miss Read affectionally known (behind her back) by all the pupils as ‘Nanny Read’ … was a tall, stately woman who wore glasses and whose greying hair was worn in a bun. Sitting in a dame chair at the fron of the room this authoritarian teacher taught her pupils who wore no uniform and frequently no shoes the 3R’s – reading, writing and ‘rithmetic. A couple of times a week before recess or lunch she would put a list of numbers on the board and randomly select six or so children who had to correctly give all the answers before being allowed outside. Mary Read died at Marrickville on 22 January 1940 and was cremated privately.